Claudine Gay (above) became dean of the Faculty of Arts and Sciences (FAS) on August 15, succeeding Michael D. Smith, who had completed 11 years of service. Gay, Cowett professor of government and of African and African American studies, and dean of social science since 2015, assumed her new duties having already been responsible for appointments in and the budget of the largest cohort within FAS (252 professors of 730-plus)—valuable experience among the faculty’s bench of senior leaders. 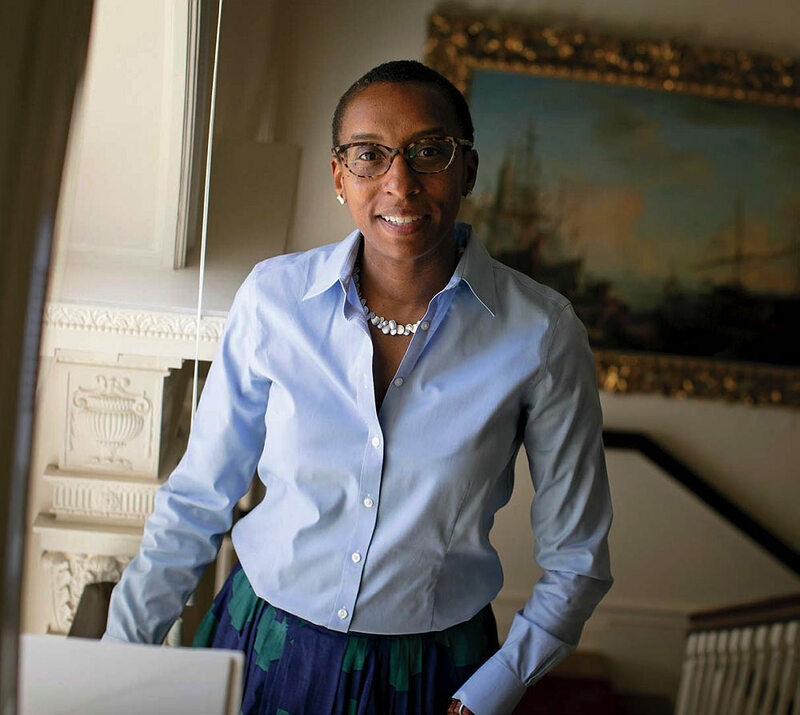 The child of Haitian immigrants, Gay earned her undergraduate degree from Stanford in 1992 (economics), and her Harvard Ph.D. in 1998. After serving on the Cardinal faculty, she returned to Cambridge in 2006. Alongside her social-science brief, she has led the new Inequality in American Initiative. Read about her background, scholarship, and initial aims as FAS dean here. Following a year-long review of its culture, and in compliance with the new Massachusetts Act to Establish Pay Equity, Harvard Athletics in June announced that it has recalibrated compensation for members of the coaching staff, resulting in increases for both women and men. The changes, to be effected in two stages, are meant to better reflect coaches’ level of responsibility, the size and complexity of their respective programs, and their experience on the job. A detailed report appears here. Harvard Medical School and the Harvard Program in Therapeutic Science have opened a laboratory for precision medicine. The expanded space houses two new ventures: a Harvard-MIT center for regulatory science, embracing quantitative approaches to drug discovery and evaluation; and the National Cancer Institute center for cancer systems pharmacology.…Separately, the new Quantitative Biology Initiative has received $10 million (half each from the National Science Foundation and the Simons Foundation) to support research during the next five years in mathematical and statistical analyses of biological problems. Comparable centers were established at the Georgia Institute of Technology, Northwestern, and the University of California, Irvine.…And the Howard Hughes Medical Institute has appointed 19 new investigators; each receives $8 million of support during the next seven years (renewable pending scientific review). Among them are Thomas G. Bernhardt, professor of microbiology and immunobiology; Benjamin L. Ebert, David-Pinedo professor of medicine; Stephen Liberles, professor of cell biology; and Beth Stevens, associate professor of neurology. When Harvard and MIT launched edX in May 2012, it had a nonprofit mission to help its parent institutions, and other schools (as they joined) develop and deploy massive open online courses (MOOCs); and a public mission: making its open-source software platform freely available to any interested user. In combination, the members and the 800-plus open-source users have reached online users now numbering in the tens of millions. But maintaining, updating, and offering that platform is not free, and member institutions may be tiring of carrying all the freight. Beyond the capital contributions they make to edX and any fees they pay, it apparently needs more resources to be self-sustaining, and so it announced in May that it is experimenting with a “modest support fee” (Inside Higher Ed reports $9 and up per course). Members can decide whether to impose it or not—so far, HarvardX is declining to collect the fee—but the days of the completely free online edX course may be numbered. Bharat Anand, faculty chair of the Business School’s revenue-generating HBX, will sort these issues out as the newly appointed vice provost for advances in learning, effective in October; he succeeds the first VPAL, Chinese historian Peter Bol. Raj Chetty (at left), whose analyses of poverty, economic opportunity, and mobility have attracted wide notice, is returning to Harvard three years after he decamped for Stanford—one of several prominent colleagues then swapping their Crimson for the Cardinal, alarming administrators and the department alike (see “Economists’ Exodus,” November-December 2015). His return seems to have been associated with an all-out recruiting effort. He becomes the inaugural William A. Ackman professor of economics (named for the hedge-fund manager, class of ’88, M.B.A. ’92). The news rated homepage Harvard Gazette coverage (extraordinary for an individual appointment), with statements from presidents Drew Faust and Lawrence S. Bacow. And David Laibson, then chair, cited them, the provost, and the deans of the Faculty of Arts and Sciences and of social sciences for their help in revitalizing the department. Read more here. Martha Minow (at right), dean of Harvard Law School from 2009 through 2017, has been appointed 300th Anniversary University Professor, assuming the chair held by historian Laurel Thatcher Ulrich, who has retired (and earlier by president emeritus Derek C. Bok). University Professorships are Harvard’s highest academic title; the recipients are recognized for superb scholarship crossing disciplinary boundaries, and are entitled to teach and pursue research in any Harvard school. Minow, who is known as an expert on human rights, is the author of many works, including Between Vengeance and Forgiveness: Facing History after Genocide and Mass Violence. She joined the faculty in 1981; read a full report on her scholarship and service here. Preparing for a capital campaign, Yale unveiled a strategy for investment in sciences focusing on integrative data science and mathematical modeling; quantum science and materials; neuroscience; inflammation; and environmental and evolutionary sciences. Those research priorities (and possibly five others) would be supported by funding for graduate students, diversity, centralized instruments, and reorganized and expanded facilities. Separately, Yale attracted Larry Gladney, a physicist and astronomer, from Penn to serve as the new dean for diversity and faculty development within its Faculty of Arts and Sciences; he will also become a professor of physics in New Haven.…The UChicago Empower Initiative, announced in June, aims to enroll a more diverse student body (Chicago lags in enrolling lower-income students). It expands financial aid and campus support for first-generation, rural, and under-represented applicants, and also emphasizes recruiting among veterans and children of police officers and firefighters. One headline decision: it becomes the first elite research university to make the SAT and ACT optional. Chief curator. Harvard Art Museums has appointed Soyoung Lee as chief curator, effective in September, filling a vacancy. An expert in Korean art, she has been a curator at the Metropolitan Museum of Art. In her new role (detailed here), Lee will oversee the three curatorial divisions, exhibitions, and collection development. Doctoring healthcare. Thier professor of surgery Atul A. Gawande has been appointed chief executive of a company formed by Amazon, Berkshire Hathaway, and JPMorgan Chase to find better, more cost-effective ways to deliver healthcare to their million-plus employees. Gawande is also professor of health policy and management, a surgeon at Brigham and Women’s Hospital, and medical writer for The New Yorker (see “The Unlikely Writer,” September-October 2009), where he has frequently reported on the maladies afflicting the provision of medical services. After the laurels. The family of the late Thomas C. Schelling, who shared the 2005 Nobel Prize in economic sciences and was Littauer professor of political economy (he mentored graduate student Lawrence S. Bacow), has sold his Nobel medal to benefit the Southern Poverty Law Center, fulfilling his request. Miscellany. Jake Kauf­mann ’93 has been appointed Griffin director of financial aid, the senior undergraduate-aid post; he succeeds Sally Donahue, who retired. Kaufmann had been associate director and senior admissions officer since 2005.…Setti Warren, formerly mayor of Newton, Massachusetts, and for a brief while a Democratic gubernatorial aspirant, has become executive director of the Shorenstein Center on Media, Politics, and Public Policy.…Moncher professor of physics and of astronomy Christopher Stubbs will serve as interim dean of science in the Faculty of Arts and Sciences, succeeding Mallinckrodt professor of geophysics Jeremy Bloxham, whose service spanned 12 years.… Erin Driver-Linn, who became associate provost for institutional research in 2008 and director of the Harvard Initiative for Learning and Teaching in 2012, has been appointed dean for education at the public-health school.…Donald Hall ’51, J.F. ’57—a U.S. poet laureate, National Humanities Medalist, and winner of the National Book Critics Circle Award—died June 23; he was for many years poetry editor of this magazine. See “Off the Shelf” for a description of his last book.